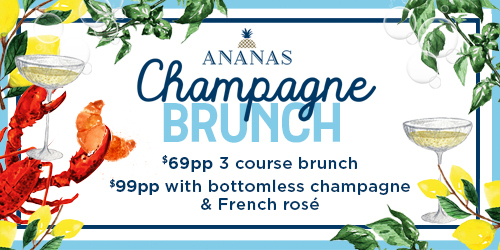 The only way to enjoy brunch is with bottomless champagne! Sundays were meant for indulging, so pop the champagne and end your weekend with our next fabulous brunch experience. Our menu features lobster specials and French classics you’ll love! Limited tables available. Bookings highly recommended. Terms and conditions apply. Not to be used in conjunction with any other offer or promotion. Ladies Lunch and ALC not available during the brunch period 11am – 5pm. Champagne Brunch menu subject to change. 2 hour seating applied.